Usually, Halloween pumpkins are painted, or carved...but not this time! Have your kid create a jack-o'-lantern fiber arts project in which he'll lace sheets of paper together to create a three dimensional stuffed pumpkin. It's a great fine motor workout and the finished pumpkin makes for a great Halloween decoration. Stack two sheets of orange construction paper on top of one another and instruct your child to draw the largest pumpkin he can on the top sheet. Encourage him to fill the page and include a stem at the top of the pumpkin. Help him hole punch around the pumpkin. Make sure to leave a fingers-width between every hole so there's enough space to sew. Move the top pumpkin shape to the side. Encourage him to fluff out several cotton balls and glue them down on the bottom pumpkin shape. Position the top pumpkin shape on top of the cotton. The stems on both pumpkins should be facing the same way. Help thread the yarn through the top hole to the right of the stem and tape the end of it on the back of the pumpkin. Have him thread the yarn through all of the holes. Tape the final piece of yarn to the back of the pumpkin. Ask him to draw the jack-o'-lantern face on the yellow construction paper. 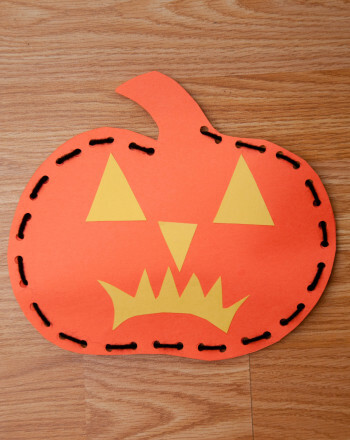 Cut out the shapes and glue them to the front of the stuffed pumpkin. Now, he can share his stuffed pumpkin by hanging it in the window, or propping it up anywhere else that needs and added touch of Halloween spook. Colour in this traditional American jack-o'-lantern, made of pure pumpkin. 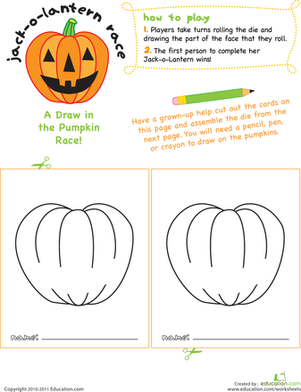 Jack-o'-Lantern Face Race is a fun drawing game that's simple enough for even your preschooler to enjoy. 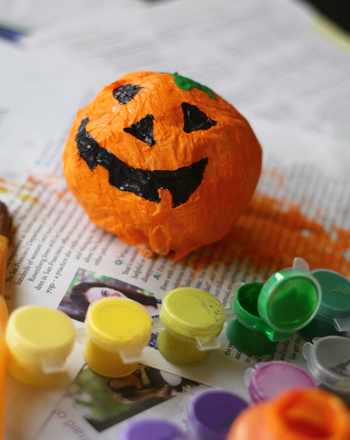 This paper mache jack-o'-lantern is a fun craft for kids who are too young to carve a pumpkin. See your paper mache jack-o'-lantern outlast its carved peers. This scarecrow is ready to frighten with a jack-o'-lantern for a head. 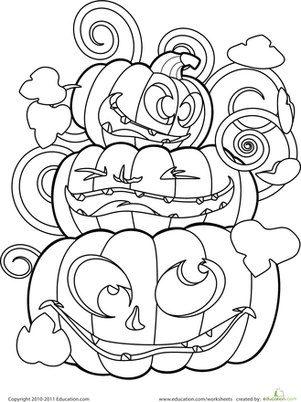 colour him in for a bit of Halloween fun. Combine art project with shape recognition with jack-o'-lantern cut outs. Here's a trio of crazy jack-o'-lanterns that's guaranteed to get your child ready for some Halloween fun. These Jack-'o-Lanterns are ready to glow all night! 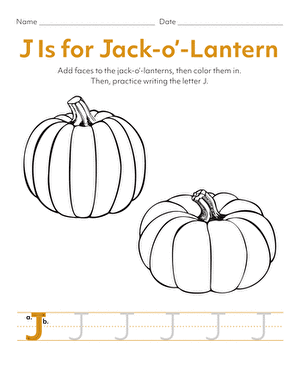 As your kid colors in these spooky carved pumpkins, she'll get a better grasp of the letter J.